Isabel de Santa Maria de Flores was the daughter of wealthy Spanish parents. Because of her beauty, she was called Rose by her parents and took this name at her Confirmation. 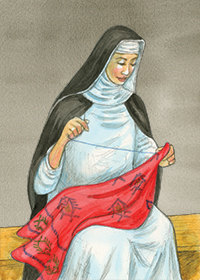 Rose took Saint Catherine of Siena as a model when she became an adult and practiced great austerities, even beyond what most ascetic saints carried out. For example, when her parents wished her to marry and a caller admired her beauty, she rubbed pepper on her face to disfigure it. Another time, when her fair skin was complimented, she applied lime to it, burning herself so severely that she was unable to dress herself for a month. Though she refused her parents’ enjoinders to marry, Rose was not disobedient to them in any other way. When an investment went bad for her parents, Rose worked all day in the garden and sewed late at night in order to help them. In response to their struggle to get her to marry, Rose became a Dominican tertiary and lived almost as a recluse in a small shed in the garden. There she experienced visions and mystical gifts. A group of priests and doctors called in to examine her concluded that these occurrences were of supernatural origin and stories of her holiness spread throughout the city. When earthquakes struck in the area, her prayers were credited with sparing Lima. Rose did not give herself up entirely to asceticism. She spent much of her time consoling the poor, the sick, the Indians, and slaves. For this she has come to be regarded as the originator of social service in Peru. Rose was so well known that when she died on August 24, 1617, senior officials of Peru and of Lima took turns carrying her casket to burial. Saint Rose of Lima was canonized in 1671 by Pope Clement X, the first saint of the Americas. She is the patroness of South America. An optional memorial on August 23rd celebrates the life of this saint. Rose's message today: All of us are called to help those less fortunate than ourselves, whether they be the poor, the sick, those uneducated in their faith—any person or group to which injustice has been done. While it may not be possible to help all of these people except through prayer, we can and should do what we can. What are you doing to help those who need your help? Do you ever pray for guidance and opportunities to give of yourself to those in need?